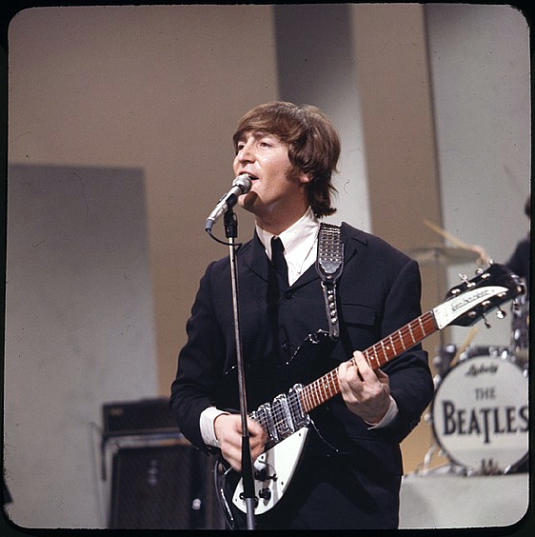 John had played a couple Rickenbacker 325 models since the band’s early days, and it had remained more or less the only guitar he used. He told an interviewer at the time that it was "the most beautiful guitar." Some were different when compared to the American originals, coming with a traditional f-hole rather than Rickenbacker’s no-soundhole or "slash" hole. And Rose-Morris renamed them based on an arcane numbering system: The "British" version of the Rickenbacker 330-12 became the 1993 in Rose-Morris’s sales material, for example, and the 325 became model 1996, and both had an f-hole in the body. Rose-Morris was happy to provide one of its "British" 1996 versions of the short-scale 325, finished as standard in Rickenbacker’s fireglo red sunburst rather than John’s preferred black. Maybe it was Mal, too, who then had a go at repairing the ailing 325. Rose-Morris, in the meantime, pounced on a great promotional opportunity. 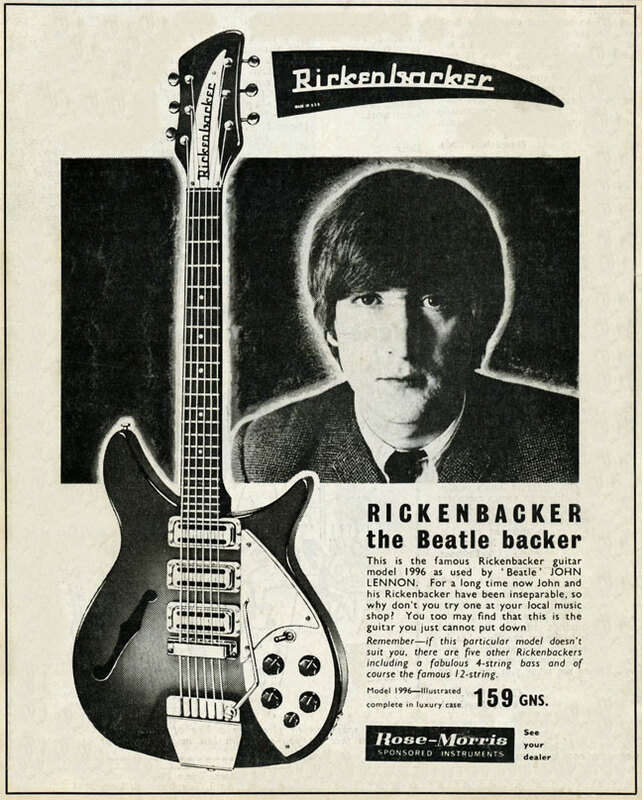 The company had already exploited the link between Rickenbacker and The Beatles, underlining the fact that John played a 325 and George often used a 360/12 12-string. 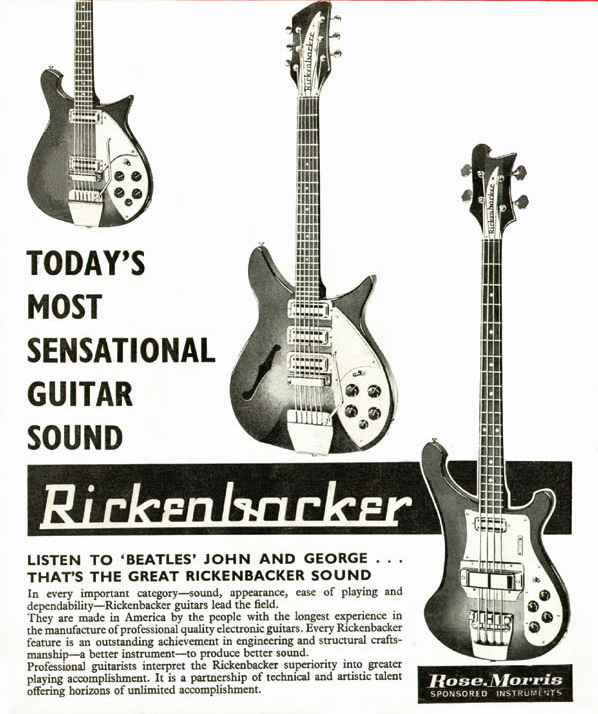 One of the Rose-Morris ads said, "Listen to 'Beatles' John And George … That’s The Great Rickenbacker Sound." After the Hammersmith incident, Rose-Morris’s next move was an obvious one. The firm quickly put together an ad for the musicians' magazine Beat Instrumental Monthly that made the most of John’s brief encounter with the model 1996. "Rickenbacker The Beatle Backer," exclaimed the new ad, with a moody portrait of John next to a big picture of the f-holed Rick. Rather cheekily, Rose-Morris then claimed: "This is the famous Rickenbacker guitar model 1996 as used by Beatle John Lennon. For a long time now, John and his Rickenbacker have been inseparable, so why don’t you try one at your local music shop?"